Does Michael Tobias’s fully-equipped Kingston five punch above its weight? A big thumbs up from us for a very deserving instrument. A stunning bass at a stunning price. Fully featured, comfortable, highly playable. We’ve looked at a variety of MTD basses over the years, and although they’ve always been of a very impressive standard, some of the instruments have lacked the indefinable X-factor which would push them into the super-desirable bracket. The Kingston’s comfortably curved ash body, resplendent in what is termed Dr Brown’s Burst over a flame maple top, is contoured very nicely at front and back, making the bass fit the player’s body like a glove. Both cutaways offer unhindered access to the upper frets and despite some headstock bias, the bass sits perfectly on a strap, despite its 4.3 kilogram weight. Both the body and neck are finished in a smooth satin finish. The neck itself is supremely accommodating, with the broadness of the maple fingerboard and the 35” scale length perfectly matched by the slim D-shaped neck profile and 19mm string spacing. As far as five-string basses go, this is a real player. With no sharp fret ends on display and an excellent setup, this really is a very promising instrument. Black position dot markers offer the only guidance as to your position on the neck, while the Buzz Feiten tuning system maintains good intonation at the nut end of the neck. Smoked chrome hardware has been used throughout, which works well with the colour scheme. The Hipshot machine heads are solidly attached and turn smoothly, while the MTD quick release bridge does its job perfectly. The control set - made up of volume, pickup pan, bass, middle, treble and coil selector switches - is sensibly laid out and easily accessible at any time. 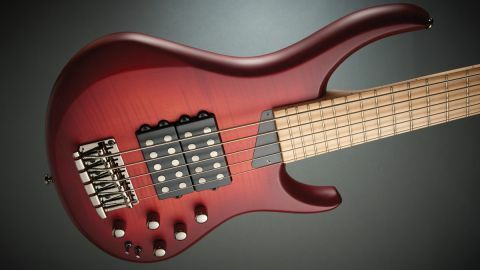 The Bartolini MM pickups instantly draw the player’s gaze, and although MTD is not the first brand to use this pickup configuration and layout, they have been matched with a Bartolini three-band EQ circuit that permits coil switching - which means that a varied array of tones should be available. As you sit with this bass, its signature tonal character stands out a mile. Every note rings clearly with a piano-like crispness: the clarity is superb, as is the bell-like quality of each note. The Kingston sounds lively and responsive with a defined attack to each note even before you plug in, which is when everything goes up a few notches. Power and punch, plenty of twang, and a very solid bottom end that sustains for days... and that’s before we’ve even addressed the EQ or coil switching. The low B string benefits from the increased scale length, but the bass doesn’t feel any harder to handle because of it. Both pickups produce a very strong signal indeed and with some investigation and experimentation, it would appear that both the circuit and the pickups are very well matched. The EQ does what you would expect, but as a Bartolini circuit it boasts certain attributes - clarity, bite, consistency in the low end and midrange and a really pleasing sparkle at the top end. All of these come into use once attention is paid to the performance of the lower frequencies of the B string. If you want a honky bridge pickup response you can have it, or if you want both humbuckers providing a powerful, full-bodied tone, you can have that too. The coil switching opens up a further range of options. Both humbuckers used in series mode provide a very substantial and full-on signal; single-coil operation supplies a bright, open sound; or use hum-cancelling parallel mode for a slightly more refined tone with less bark and bite. Take it from us, there is plenty of tonal colouring available here. In terms of comfort and playability, this really is a highly pleasing instrument - and no matter what style of music you play or which playing styles you prefer to utilise, this bass can address all of your playing requirements. We challenge anyone not to be impressed by this bass: it really has it all, and the fact that it comes in just under £900 is the icing on the cake. Most basses have some aspect about them that lets them down somewhat, but we’re truly hard pressed to find anything about this bass that detracts from its performance.